Compost bins can remove loads of waste and make loads of garden compost - a clean nutritious soil improver. AUTUMN - sweep autumn leaves into bags and containers to make leaf mold or for composting later on. Vegetable kitchen scraps, old plants and flowers provide continuous small amounts to compost. SPRING - skim annual weeds into composter. Mix fresh grass with autumn leaves to make compost pile, ready by summer for autumn gardening. TIP: Spread leaves on lawn to mow into grass cuttngs. SUMMER - Green manures nettles and comfrey cut from spring onwards keeps compost bin fired up. In July / August cut hedges and shred into bags. LATE SUMMER - Grass resumes growth. Mix cuttings with soft shredded hedge trimmings for an ideal green/brown mix for the compost bin. See Compost Tumbler Bins for autumn ready compost. Compost bins, worm bins and other techniques enable you to recycle on-site to get the nutrient value all over again - no noise, fuss, or carriage to recycling centres. Let's start with compost making bins. 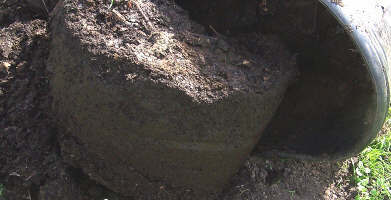 Different types of bin are used with different composting methods. My notes on the links below explain these methods. My Dad wouldn’t recognise my 'space-age' composter. On this link I explain the advantages and practicalities of using these modern continuous composters - I've describe how they suit different needs. Continuous compost bins explained on this link. All gardens thrive on garden compost - all soil types improve. My best continuous recycling bin is here & my big heap is here - I explain more on each page. I prefer these to drum or tumbler bins, but these have advantages too that I explain. My drum compost bin saves liquid compost. Check these on my special page about bins that rotate to turn the whole heap, aerate and speed decomposition. Advantages and use of tumbler bins are explained on this link. Is Plastic Any Good For Compost Bins? Here I explain more about the minimum heap size and how my big heaps have worked to produce good garden compost. You can also find kits for making traditional timber composters - all on this link. My explanatory notes (free to read by clicking the link) deal with the basics, so you can better understand the composting process and adapt a method to your needs. I think you'll agree - the worst part of mowing the lawn is not pushing the mower, but emptying the grass box; and the worst part of cutting the hedge is not the cutting, but gathering up the clippings. ...and with that in mind you probably put off doing the jobs. So let me introduce you to some tools and methods to make all these jobs easier. Collecting material for composting: First, here's a few very handy tools to help you collect your garden waste and make the hard work easier. Worm Composting: Specialised worm composting bins are useful if you don’t have a garden but grow house plants, or when you want to make compost for plant containers or seedlings. Some types of worm bin are definitely easier to use than others. 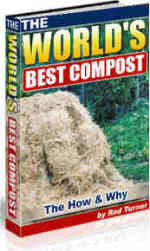 Find out how to make and use worm compost here and get the inside knowledge on good worm bin designs here. Use garden compost effectively and efficiently: With just a few compost bins, gardeners can rarely make enough garden compost to go around. So find how to economise and prioritise compost distribution. This link gives details on how to distribute and apply compost. Mix your own seed and potting compost: You can make your own seed and potting compost out of ready to hand organic ingredients like leaf mold, coir, loam etc... The advantages include saving on cost and bulk, while your compost is better suited to plant needs - find more on making compost for growing seedlings and plants here. Compare Proprietary Compost for Seedlings and Potting: What is multi-purpose compost, evaluate peat and non peat alternatives, will your compost bin help? My compost garden page checks them all out. Compost Gardening: You can make and harvest organic matter by re-using, recycling and converting nutrients to organic form with green manures. Commercial growers make useful organic fertilizers and soil conditioners from their nutrient/organic waste streams. Read more on this link about ready made organic fertilizers and how to use them. How do YOU make compost for your garden? You can also upload pictures to your page on The Home of The Organic Gardener. So why not share with us the secrets of your compost heap. Every gardener has a different story to tell and you may have some useful advice for other gardeners. We all like to learn from other gardeners and you are probably have some good advice for other gardeners. You are also welcome to include questions but do give a full description as your page should be around 300 words+ that's to ensure it will be viewed by lots of people. Savvy Vegetarian - support for vegetarian diet, healthy eating & green living, with free advice, articles, blog, recipes, & resources.